"That time was like never, and like always. we find everything waiting there." When I really love a perfume, I am reluctant to analyze it. Breaking it into details will rob it of its magic. The tops notes of this, the heart accord of that, the hint of the other, perfumer's intention, the concept, the whys and the hows of it all...no, none of that today! Does any of that matter? I never expected to love a vanilla created by Jean-Claude Ellena, and, having fallen in love with it, I don't want to know why. Nor do I believe it is possible to know why we love something or somebody. I don't mean "like", it is always possible to know the reasons of like...I don't love somebody for his brown eyes, sweet smile and sense of humor. I like him for that. I love him for no reason at all. I like the unripe, slightly salty melon of Vanille Galante, the cold lily note, the almost non-existence of vanilla, the pure, calm water in which the ingredients serenely flow, the pastel colorlessness of it all. But these are details. Details don't always add up to love and never explain it. Why do I love the scent like that, which I was not meant to love at all? I am not a fan of vanilla, I am not fond of pared down compositions, I certainly don't appreciate aquatics. Is it quantum physics, molecular attraction, timing...? When there is no reasonable explanation- it's love. 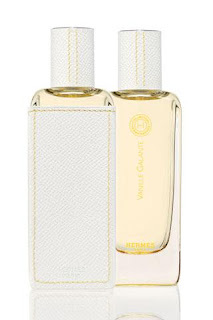 Vanille Galante is available at Hermes boutiques, $235.00 for 100ml or $145.00 for a very convenient set of four 15ml bottles. I caught a whiff of this on a friend at the Sniffa a couple wks ago. I was fully expecting not to like it. Aquatic. Lilies. And only vanilla in the most abstract sense. I was wrong. It was lovely & I need to smell it again, on me this time. Yep, exactly. I am still in shock I love this so much. Bashert. Love that! Sadly, it was not to be for me and VG. But...maybe I should retry it. Maybe magic will happen the second time around. Bashert. That's it. Some things are just meant to be. I admire it, respect it, would wear it (although I know melon blooms on me), but do not love it. I do, however, love Sublime Balkiss, another wholly unlikely choice. I think anyone who believes in destiny is just making an excuse for not be responsible for their own decisions. I do it all the time. Yet, I know when I blame fate I'm really just being cowardly. Then I feel guilty. Oy, vay! I know what you mean about unexpectedly liking something. I never thought I would like the smell of ink and incense (ink??? ), but I love Commes des Garcons 2! Oh boy, I will probably love it too! That is, if I ever get to try it, since Hermes apparently likes to keep their best stuff away from me! I swear my eyes rolled back in my head when I inhaled this lily "thing". I get the vanilla...just the perfect amount. I can't wait for Jean Claude to get his hands on tuberose. A guy can fantasize. Marina, I'd have been very puzzled if you hadn't loved this, given that we often have very similar tastes. I did have a shock when I smelled Vanille Galante -- the "wow" thing. But then I went back and analysed. Do you get that teensy whiff of hay/tobacco/narcissus right at the start? And that impression of the lightest possible dusting of vanilla-infused sugar? And the whiff of clove? Oddly, I don't read this as aquatic, but as airy. Equally surprised to love this as much as I do. I wore it a lot when skiing, it was amazing in the crisp cool mountain air of the Alps, like being wrapped in a veil of the softest and highest quality pashmina. When I first tried this I thought, where have I smelled this before?? It reminds me so much of Stephanie de Sainte Aignan's Eau Nirique, but minus the jasmine. I smell a lot of banana here...although it might well be the melon and my nose is deceiving me. I wasn't initially wowed by it, but the weather is getting warmer now, and I think that might make a difference. I absolutely agree with you. We make our own destiny. But it's nice to believe in fairy-tales sometimes. What a lovely nickname you have. CdG 2 is fighting another scent for Top 1 in my personal hit-parade. What you need to do is come to NYC and we will hit all the boutiques and counters. Once a twin, always a twin :-) I agree about tuberose. I was smelling Goutal's new Matin d'Orage and was thinking how much better that transp[gardenia could have been if done by JCE. You know, I get no "base notes", so to say, in it. Nothing at all dark: melon, lily, water, a touch of vanilla, that's it. I kind of thought that, as I liked Mousson and love watermelon notes, I could at least not hate this, but I was scared of vanilla. Oh, now I wonder just how it would "sound" when it is cold! Let us know what you think, when you do. I am trying to remember if I tried Eau Nirique. I do not get banana in VG, but that's just me. I am glad I don't :-) I have this feeling VG might become sweeter in warmer weather. I feel that a warmish spring day is ideal for its pastel beauty. We sniffed this weekend before last at the Hermes store in Las Vegas and it was pure love for my hubby. I got him a bottle for his birthday and then couldn't keep the secret until late May... he is wearing it today and it's love, love, love. I never thought a cold vanilla could exist, but it's exquisite. Yay, go Mr Ducks! :-) "Cold vanilla" is a perfect way to describe this. Your Bashert is killing me, I'm laughing alone by my desk, watching the trees at the open window thinking the greatest things are Bashert.....Quel Amour by Goutal was Bashert at the time, for me, because with all its frank playfulness it just swept my inhibitions away. I read about the fragrance an excellent review by Octavian, but I don't know how to get it sent back here to the far far end of the Mediterranean. You must be tired of hearing how glorious is your blog, but I won't make it any easier for you: it is just glorious! I MUST try it as soon as possible, based on this review alone. Spasibo, kak vsegda ty napominaesh' mne o tom chto samoe glavnoe v aromatax--pure pleasure! I hope you review it after you smell it, very curious to see what you will think of it! For a "not-review" review, that was perfect. And I just wanted to thank you for such a beautiful and appropriate description of a scent you love. When something is more than the sum of its parts, it really is magic, isn't it? If you can explain love, it isn't love. Thank you! And I absolutely agree. Love is inexplicable by definition.